Authorize & Capture: will let you authorize and capture the payment immediately. Authorize only: will let you authorize the transaction but not charge your users. 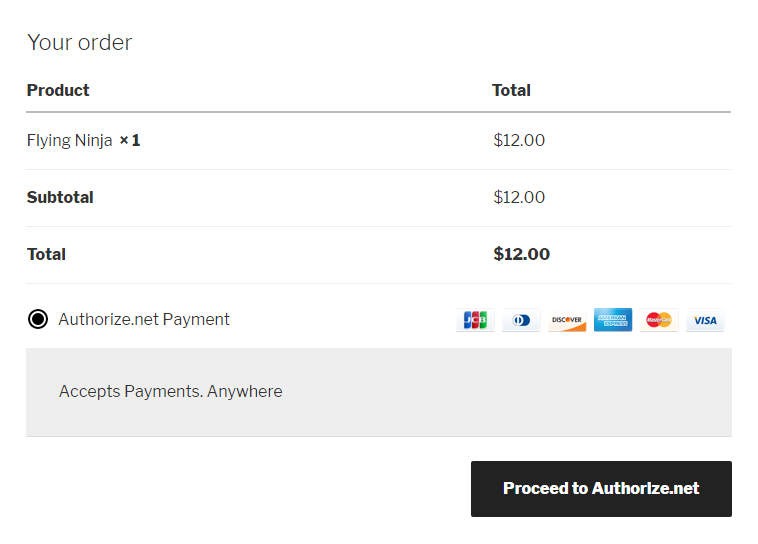 You can review the order or any other details and then capture the payment from your Authorize.net account. Please, note: the authorization time expires after 30 days, so, all authorized transaction that are not captured within that time, will change to Expired, and the funds will not be transferred. For more information about the Authorization Only transaction, please, refer to the official documentation. Configure the Login ID: it’s for the Univocal Login ID associated with your account registered on Authorize.net in the section API Login ID and Transaction Key. The transaction key is the Univocal key used to authenticate requests to Authorize.net. Access your registered account on Authorize.net and recover this information in the section API Login ID and Transaction Key. The Md5 Hash is the unique key to validate the answers from Authorize.net like you can see in the screenshot above. It should be set identical both in plugins settings and Authorize dashboard. You can enable Authorize.net in test mode to test configuration and if the plugin is functioning correctly. To work in Sandbox mode it is necessary to create an account on developer.authorize.net. Production and Sandbox accounts are two different accounts, and it won’t be enough to only enable this option to switch to sandbox mode. The Admin will also need to create a sandbox account here: https://developer.authorize.net/hello_world/sandbox/ and set Loing ID and Transaction key for this account in the plugin settings. 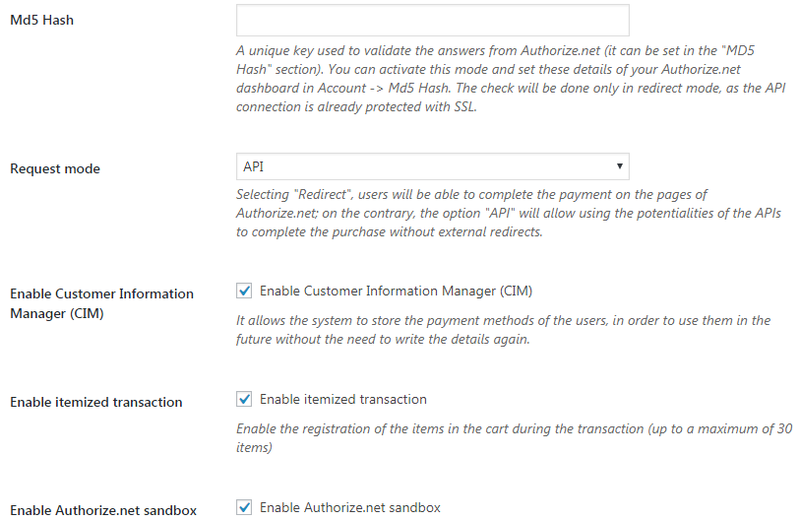 In order to test the plugin configuration, enable Sandbox mode as explained above Then, go on with your test purchase and select Authorize.net payment mode during checkout. In order to test the credit card method, you can use some randomly generated card numbers available on this page. Now, if the test has been done locally, the system will generate an error, otherwise, you will be redirected to the page My account if successful or to checkout page if any error occurred (incompatibilities between currency and payment method are frequent). NB: Check order state during and after payment from WooCommerce panel. 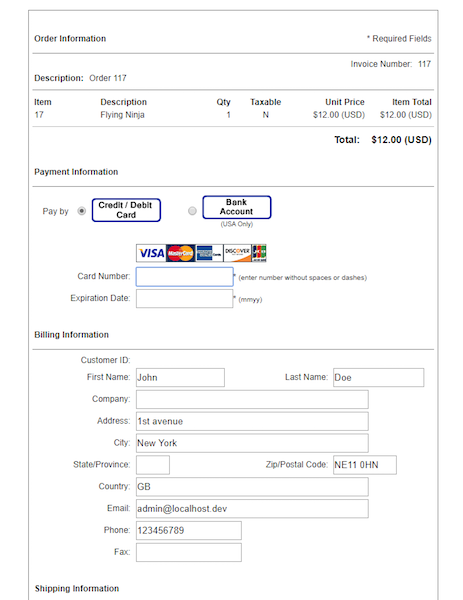 During payment order state is labeled as pending payment; once the order has been completed its state will be changed to processing or complete. 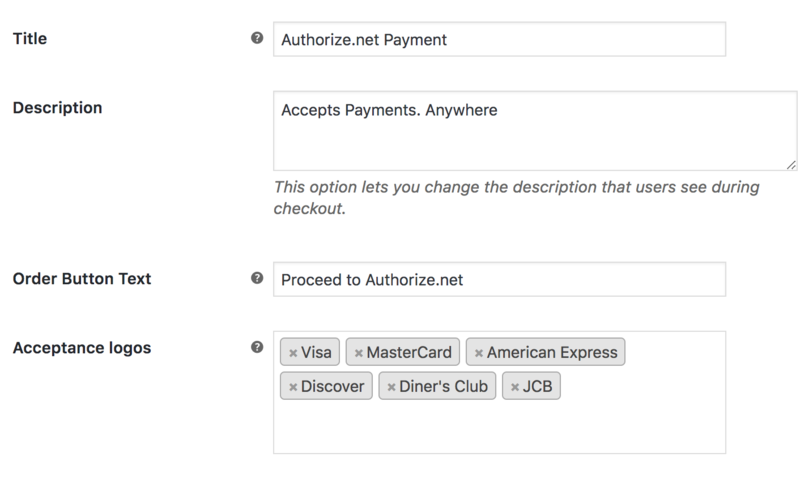 You can customize the checkout page by filling in a title, for the payment method. For example Authorize.net Payment. And also you can set the description, E.G. Accept Payments. Anywhere. Order Button text allows you to set the text for the order button, For example, proceed to Authorize.net. And acceptance logos is the setting of which cards you want to accept. Please Note: Excluding a cart from here does not prevent a user from paying using this method.